: 7QT - the 4th, Indy, sneak peak, bloggers! 7QT - the 4th, Indy, sneak peak, bloggers! 1 - You knew this was coming, right? Shooter Jenning's 4th of July has been my song for the past five or so years. Love this one. 2 - Drinking game: every time I say the word "just" take a sip of your drink of choice. Fair warning: you could get tipsy. Fulton Sheen and the miracle of Baby James from the Catholic Herald out of London. Also, in case you missed it, you can hear my interview with Patrick Coffin by going to the archives at Catholic Answers. They are supposed to be up Friday but I'm writing this on Thursday so I'll just link to the blurb about the show I was on as I continue to squeal inside that I was on Catholic Answers and got to speak with Patrick Coffin. Also, Patrick Coffin, if you are reading this please know that if you are ever in our neck of the woods you are officially invited to our home for steak, beer, and chocolate chip cookies. Those are the things we do best here. 3 - I realized yesterday that I'm always talking about how I finally have a mantel I can decorate for the holidays but I hadn't decorated my mantel for the 4th of July. 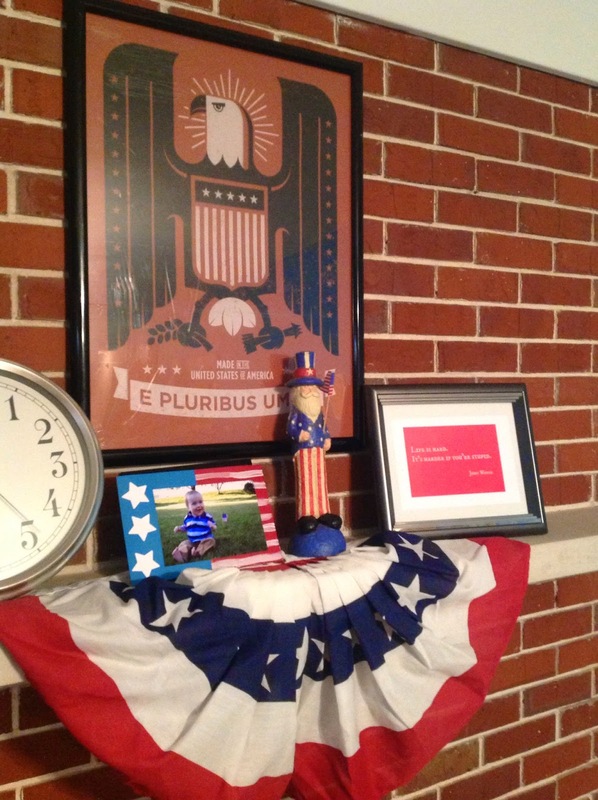 The sad truth is that I don't have a lot of patriotic decorations. This new-to-me Jude Landry print, some bunting, and one of the invitations to Joe's 1st birthday party are good but I still have a ways to go. It's too much red, I think, with the red brick and all. Any ideas? You would think the quote would be something American-y. But actually it's just John Wayne's line "Life is hard. It's harder if you're stupid." From a distance it looks fine. 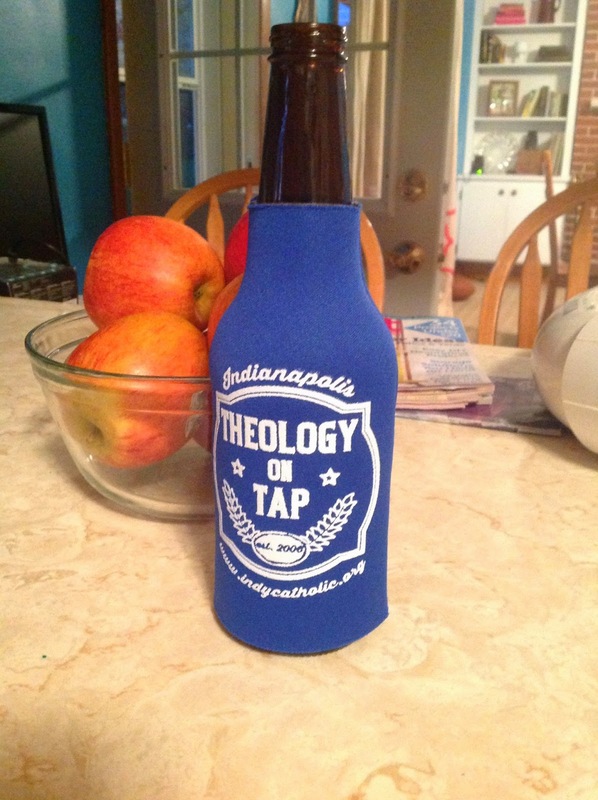 4 - So last week I was in Indy to speak at a Theology on Tap. The crowd was great. Look at them! I met one of the co-founders of Verily, and I spent time with lots of wonderful, amazing Catholics. I met some blog readers (Shout out!) and the directors behind The Third Way video. It was all really great. They gave me a koozie and I love it. 5 - Yay for married bloggers writing great stuff! The vulnerable victory of true love: the Sacred Heart, ABC's Once Upon a Time, C.S. Lewis, and The Princess Bride by Haley at Carrots for Michaelmas was a delight and Quidditch: the real sign of Amercia's moral decay by Daniel Stewart was hilarious. My favorite part was the line about Ben Franklin. You have to read this. 6 - I've been getting a lot done on the house - a lot of cosmetic stuff. We need to still clean out the basement, move a bunch of storage stuff from the garage to the basement, clean out the garage, plant the flowerbed in the front, put in new plumbing and electrical and windows, dig all the thistles out of the yard, rip out the old patio and pour a new one, maybe put in a less grand one of these with some landscaping rocks we were given - all along with the long term goals of renovating the bathrooms and kitchen and getting new flooring throughout most of the house. Travis has been working so, so hard - he's taking care of the back-breaking work and doing things like patching the roof that was still damaged from the November tornado. And then there's me, doing the cosmetic. I hung some pictures recently and I finally got the computer desk under control. I am excited to take pictures of the whole house and walk you through it, but for now, here's a little sneak peak of the computer desk area. 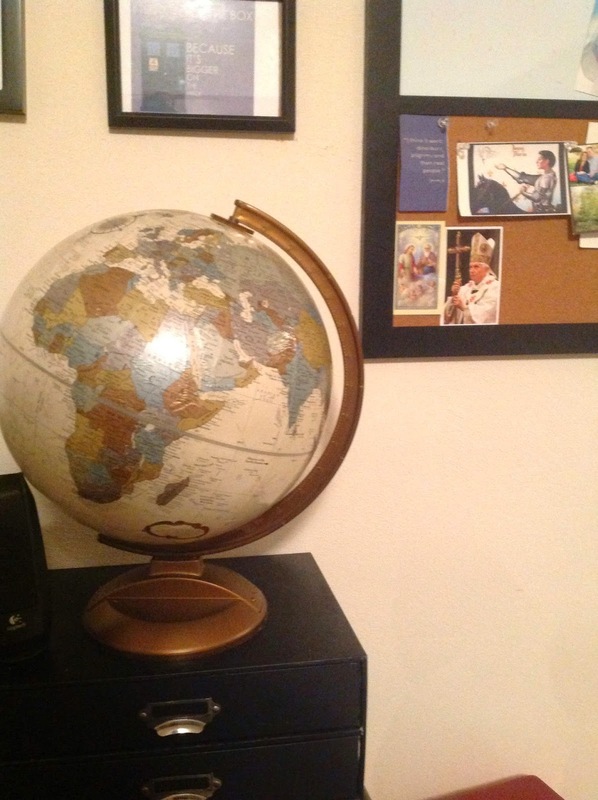 Why yes, that is a Tardis in that picture frame. 7 - -Let's all say a prayer for Jenna, who is taking a break to take care of herself. Good for you, Jenna! God speed and God bless. You are in my prayers. Glad you had a good time in Indy. It's a great city. Good for you, getting things done on your to-do list. Cosmetic improvements are important, too! Love Catholic Answers but somehow I missed you on it. Need to go listen on the website. We're all finished with moving, too, and finally settled in.